Father’s day is just around the corner and we thought we would share some ideas for Frugal Father’s Day gifts. I find it harder to find gifts for father’s day than for mother’s day, often father’s like electronic gadgets which do not really qualify as frugal father’s day gifts. 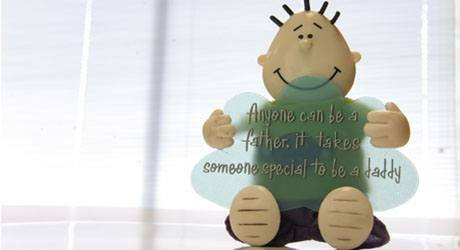 Well here are some frugal father’s day gift ideas; finding affordable gifts for father’s day. A Day Off -Your Dad works hard, and deserves a day off from time to time, so make Father’s Day that day. Let him know that from the moment he gets up till he goes back to bed he can do what he wants – watch TV, hang out with the guys, tinker with the car – it’s all fair game on Dad’s Day Off. Clean the Car – A freshly detailed car is guaranteed to make a great father’s day gift. Grab a few supplies from around the house and get busy washing, polishing and vacuuming your Dad’s ride into tip-top shape. Record A Video – Dads like to know how you feel, and sometimes they don’t hear often enough how much they are cherished. A creative gift for Dad can be inexpensive (and mean more than a more costly material item). Believe it or not, he’ll probably treasure your sentiments much more than that new gadget you were considering. Make a list of your best family memories, all the lessons Dad has taught you, then take a camera and pour out these thoughts and feelings on video for Dad to watch again and again. Amazon– I am alway surprised with the great ideas and deals you can find on amazon for father’s day. Just make sure you order early you it gets there on time. Write a Letter – Write a letter instead of a card, write about all the good memories you have with him, all the things he has done for you and things you have learned from him. Split the Cost with your Siblings – If your dad has his eyes on something that’s a little out of budget, you can always split the cost with your siblings and share the gift. It is a win win situation as your father gets the gift he wants and you don’t break the bank getting it for him. Barbeque Day – We all know how much our dads love a good barbeque with the family. Invite members of the family that your father likes to spend time with, buy some groceries and arrange to have some beer and you have a happy father for father’s day – let’s hope the weather co-operates. Engraved Stylus Pen/Pen/Key Chain – If your father is technically savvy and owns an iPad or iPhone than an engraved Stylus Pen is an original and sentimental gift. If not, an engraved Pen or Key Chain would be great as well. Put some thought into the engraving and make sure it is something unique or special to you and your father; try not to make it generic. Car/Barbeque Accessories – Most dads love to spend time barbequing and fixing their cars so why not get them an accessory for their barbeque or car. There are a range of small and inexpensive options for both that dads will love. As well, if your father is an avid gardener than you can chose from a variety of low cost accessories for gardening. Remember, shopping for father’s day gift doesn’t have to be stressful. Just find out what will you’re your father happy and you’ll be surprised that most of the time it does not involve a lot of money; but just a bit more effort. Happy Shopping! John: Garage clean up – This is something that my brothers and I did for our father once and it was a smash hit. We basically scrubbed down the garage, turning it from a dank pit into a very nice, clean place. The key part was that we noted where every item of importance was before we started cleaning and we put many of them back in the exact place we found them, save some tools and things that had designated places, so he had no trouble finding anything. Michael: Garden weeding – My brothers and I did this for Father’s Day one year. We pulled a ton of weeds out of the garden, saved them in a bag, and gave him the bag of weeds as a gift. With the three of us working on it like madmen for several hours while my parents were off doing something else, we saved him many hours of work in the garden, freeing him up to do other things that he would enjoy instead of the relative tedium of weeding. What are your father’s day gift ideas? thx liz some great ideas with the books! that were mistakes that changed the course of the game — very fun book called “What Were They Thinking? The Brainless Blunders that Changed Sports History.” Think Bill Buckner, the Babe Ruth trade, the Miracle on Ice hockey team and all kinds of other fun stories about things that went awry. You don’t even have to be a sports fan to enjoy it — there’s enough entertainment to be found without already knowing stats forwards and backwards. The best Father’s Day present I have received to date has been a duct tape wallet that my boys and wife made for me last year. It just doesn’t get any manlier than that and I so appreciated the effort. I felt like they really get that I would love something made entirely from duct tape. If you are looking for that perfect gift for your dad and that too at a reasonable price then http://coupongrove.com/PicturesOnGold/ would be the perfect place to shop. They have some amazing customized Men’s jewelry made out of 14K gold. the perfect gift for the perfect dad. there are fantastic discounts also available. Father’s day is an interesting event for daddies! I washed his car as a gift. you people have NO SENSE because they are ALL STUPID AND LAME TO ME . I’m actually going to be in the same country as my dad this Father’s Day. Looking forward to a day of beers and hanging out. p.s. – I retweeted this . More seriously, I’d love for my kids to spend no money on father’s day. Them not spending money is actually an additional gift they would be giving me. It’s not like I actually need anything that costs money – I have enough stuff already. I was just gonna take my dad out to the movies and go to the archery range with him – some quality father-son bonding time.